In less than three weeks (since I spoke in GIGS2013 Summit), this Big Data concern had had me involved in more direct and personal way. 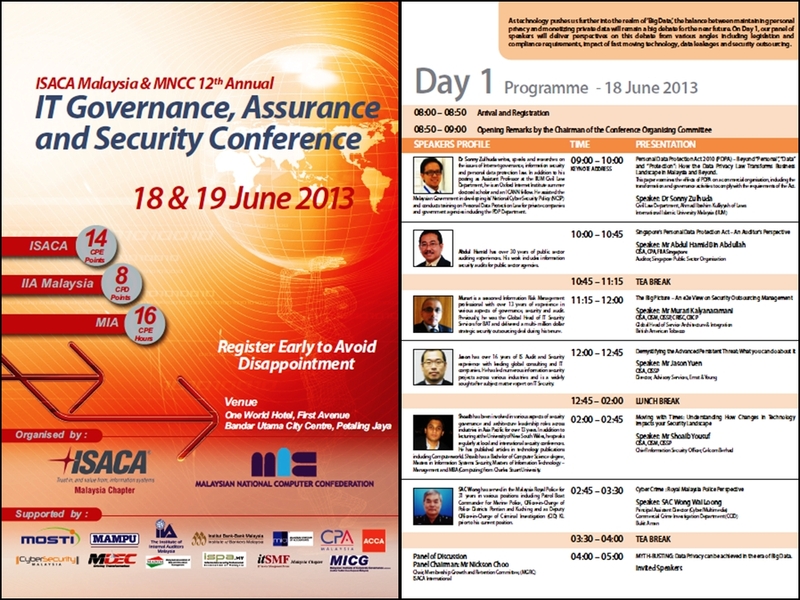 The Malaysian chapter of the Information Systems Audit and Control Association (ISACA) – yes, you’ve heard about their CISA and CISM professional certification, that’s their product – will hold its annual IT Governance, Assurance and Security Conference on 18-19 June 2013 in Kuala Lumpur, Malaysia. The massive intersection between the Big Data, security issues, compliance as well as data protection legislation had taken me into the epicenter of the complicated development of IT governance: I will be delivering a keynote address of the event with my paper entitled: Beyond “personal”, “data” and “protection” – How the Data Privacy Law Transforms Business Landscape in Malaysia and Beyond. — wow, that is.. long! In short, I will be speaking about the latest development on Personal Data Protection Act 2010 in Malaysia and how it affects Malaysian business especially in relation to IT governance, IT security and IT assurance. I will be exploring this Act from both legal and industrial perspectives, highlighting the need for risk management and due diligence that will change the way we do our business. My paper can be summarised as this: That this PDPA 2010 is not only about legislating the bulk of personal data, but it is about ensuring business continuity and achieving good governance. PDPA 2010 is not only about preserving expectation to individual privacy, but it is also about creating a socially responsible business in Malaysia and beyond.. This will be achievable only when all the stakeholders have a common understanding and thus subscribe to common benefit for business and society. We all need to understand this as a major shift from a sub-unit issue to a board-room concern. This is a national event. Joining the ISACA in co-organising this is the Malaysian National Computer Confederation (MNCC). The event had also included in its supporters and collaborators many prominent parties from both government agencies and industrial associations on IT security, audit and corporate governance. If you have a chink of interest, check for more at ISACA Malaysian official website here. Or you can download the full Conference brochure here. 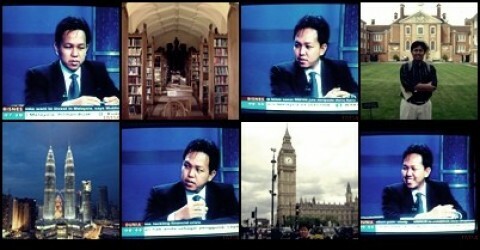 Speaking at the Global Information Governance Summit (GIGS 2013) Whither Digital Privacy: Be afraid, be very afraid!